This week presenting beautiful princess Merida. Jo Merriman made this adorable doll based on my FairyDoll pattern, and you will all agree, she made wonderful job designing Merida. Thank you Jo for this great idea and pattern you share with us! 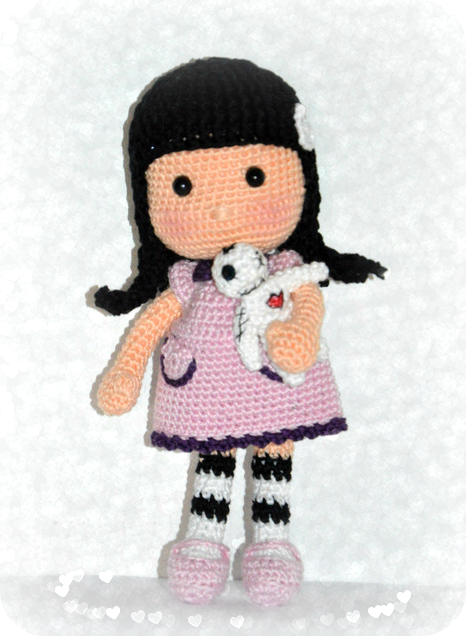 Materials you will need to make this doll can be any of your choice yarn with matching hook. For dress use some petrol green color, darker green or blue, all will work nice. 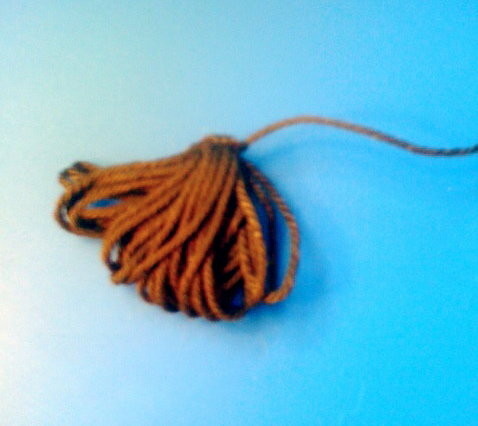 Bow and quiver make in brown (some leftover yarns will work well) – same color you can use to make Merida’s shoes. Jo added tiny bits of beige on top of the dress and sleeves. And orange to make Merida’s beautiful hair. 2 black beads 4-5 mm round ones for the eyes. Legs and body is the same pattern as used for BB dolls. Work with white or color you will use for dress. R27 Either change to a separate color as in photos or change to flesh color. Sc6, insert hook in r below (1st pic) yarn over and pull long loop, insert into same sc and create a second long loop into same sc(2nd pic), sc 5. 13sc. Tie off leaving long end for closing the last round nicely. Cut the wire little bit shorter than the bow is. Secure the ends with little bit of tape or glued yarn over wire ends. Place the wire inside the bow. 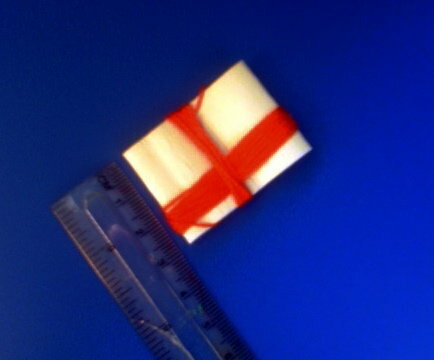 Fold the piece so it forms the bow shape. With silver or white or beige color thread make bow string. Knot it on one side, wrap few times, stretch over the bow from one end to opposite, tie knot, wrap few times. 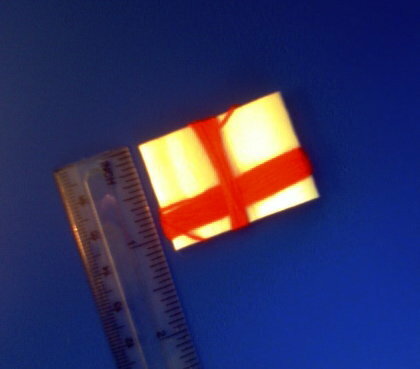 To secure ends you can either glue them or sew them inside the bow. the bow is a 12inch pipe cleaner folded in half and shaped as a bow. using brown yarn tie a knot near bend, wrap yarn around tight to the end and then back down over knot, next bit a little tricky, sc a row down length of bow to the next bend, wrap yarn around to the end, tie a knot and wrap over knot, I put a dab of glue at both ends has yarn tends to fall off when wrapping, this took a few attempts to correct as it can be a little tricky. the bow string I used some very fine silver thread, tie and trimmed a knot at each end wrapping yarn a few times around the knot for picture effect. Ch20 (making belt), wrap the belt around Merida’s waist and sc to first chain stitch made. Tie off , hide ends. You can also make arrows with some tiny feathers. Work with hook size bigger than used when making head. This will make the cap fit the head nicely. Tie off leaving long end for sewing the cap on the head. 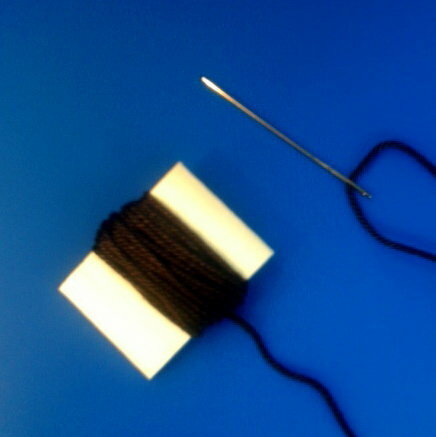 Making crocheted swatch. It is worked in rows. Ch1 and turn after each row. Dampen the swatch made, put it on a towel and leave to air dry naturally over night. backstitch across the tape making sure to catch all the yarn. I made a couple of rows over just to make sure the stitching was firm. I attached cap to dolls head then the hair, pin in place from the front then to the back, the row of back stitch acts as a parting guide in the hair, so for mine I placed it over left eye at front going towards middle of head at the back. 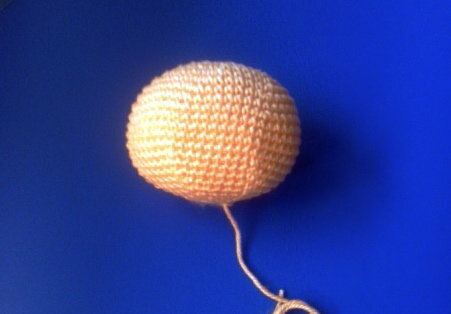 I then used same yarn as hair and made small back stitches over thread attaching hair to cap. Then cut a few loops at a time, depending on were you attached the hair will depend on if you cut the hair in the middle of the loops or to the side like mine, I left mine loose but the hair could be trimmed once fitted. R2 ch4 sl st first stitch made, tighten the ring, 1 sl st, 1sc, 1hdc, 1 sc, 1 sl st.
Sew all parts together and your princess Merdia is done! Here is mine! I can’t even express how much I enjoyed making her! Hope this post and our Facebook friends as well as all of you who will come to see this post and leave the message, will encourage Jo to finish what she started with creating other Disney princesses, we can share and make. Hip, hip hooraaay for Jo! Thank you all for stopping by and taking time reading this post. Hope you like it. Looking forward to hear from you and see you Meridas soon! added .pdf of this pattern under Free Patterns page for your easier download and use. Hello dear friends. Finally managed to finish the little ones. Dolls were easy, but I promised to make tutorial on easy way to needle sculpt the face and added one more about crocheted doll’s hair that I hope many will enjoy as well. 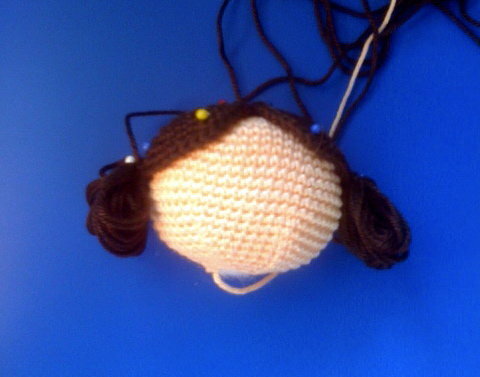 made this very simple pattern for dolls hair, where I have tried to explain what you have to look and pay attention to when adding crocheting hair on any doll’s head. That is basics and I hope will help many of you that weren’t so sure about how to start and how to make crocheted dolls hair. Understanding this basic pattern and making at least two of these mermaid hairs, I am sure you will become familiar and free with trying out some of your own creative hair styles and maybe even free making your own little dolls and patterns. 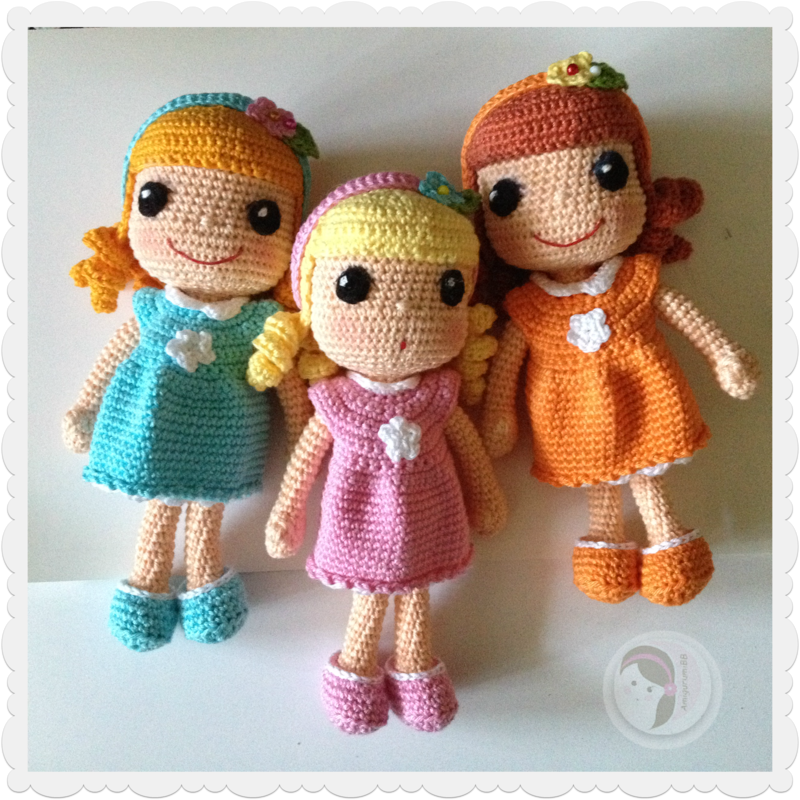 The pattern on crocheted hair basics you can find under Help pages and tutorials. There you will also find tutorial I have made as addition to these little mermaids that will show you, step by step on how to easy needle sculpt dolls head to make her smiling. Today will share simple pattern on how to make your little mermaids. These are very special mermaids! When they are outside the water they look as any ordinary girl, but the second they enter the water they turn into beautiful mermaids enjoying the depths of the deepest seas, swimming with whales and dolphins. Decorating hair with starfish and pearls. glue (optional) for extra reinforcing the hair and top of the swimming suit. Add some more stuffing if needed, tie off . R13 *ch13, starting from 4th ch stitch from hook, inc10 with dc sts, skip 3 stitches on the fundamental row (R12), sl st in 4th st* repeat around (before the last ch13 you will have only 3 stitches left, skip 2sts and sl st in this 3rd, repeat chain 13 and 10 inc dc over chain made to finish this row. Continue sc on the other side of the hair piece (from magic ring towards the end of the side made), tie off leave long end for sewing the hair on the head, or hide ends if you decide to glue the hair on the head. After fringes are made, continue with *ch3, sl st next st* across the other side of the hair piece. When reaching end, tie off and leave long end for sewing (if you will sew the hair on the head) or tie off and hide ands if you are gluing the hair on the head. Sc on the side, stitching up, towards magic ring, make 3 fringes (or as desired) with ch10, sl st 9, finish with sc over next side (towards bottom of the hair piece) tie off leaving long end for sewing or tie off and hide end if your hair will be glued to the head. Tie off. Stuff the leg. (I always like to slip stitch to the stitch that is closest to next leg, so I can connect legs right at beginning and simply stitch around). Stuff the body nice and firm. Tie off leaving long end for sewing the body and head together. R2 sl st last to first st, ch3, dc2 in next st, dc2 to next, ch3, sl st to next st, ch3, 2dc to next st, 2dc to next st, ch3, sl st to starting sl st. Tie off leaving long end. Wrap the yarn around middle three times, pulling on every round, in order to make nice bow looking piece. Then using both yarn ends make a knot on the back side of the bow. Cut them to desired length but enough to tie around mermaids neck and make a little bow. You can sew or glue this top on mermaids chest. Tie off hide end. Your mermaid body with fin is done. You can add some beads or bows or shiny threads over front loops. You can also stitch across in spiral using some nice simple edging pattern. It is to your choice. I left it simple but possibilities are endless, and do not hesitate to experiment and add your own touch to it. Tie off leaving long end for sewing the arms to the head. By now all of your body pieces are done, and your head is needle sculpt. Sew all of them together nicely. Put the mermaids outfit on your doll and she is ready to play with. I hope you have enjoyed making your mermaid and that you will make at least two of them. What I hope more is that your daughters, granddaughters, nieces or little girls next door will enjoy them even more. 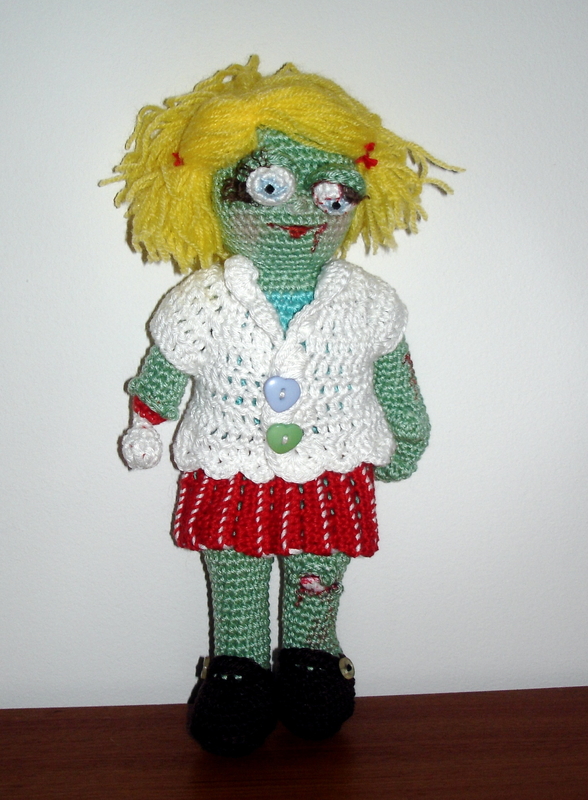 Last week I announced doll I was working on, zombi Vanja; doll I tried to make based on the pattern provided by Jennifer from SquirrelPicnic. In most of European countries, the February is month of carnivals. All credits for the pattern goes to Squirrel Picnic and Jennifer! This doll was made from my second try. 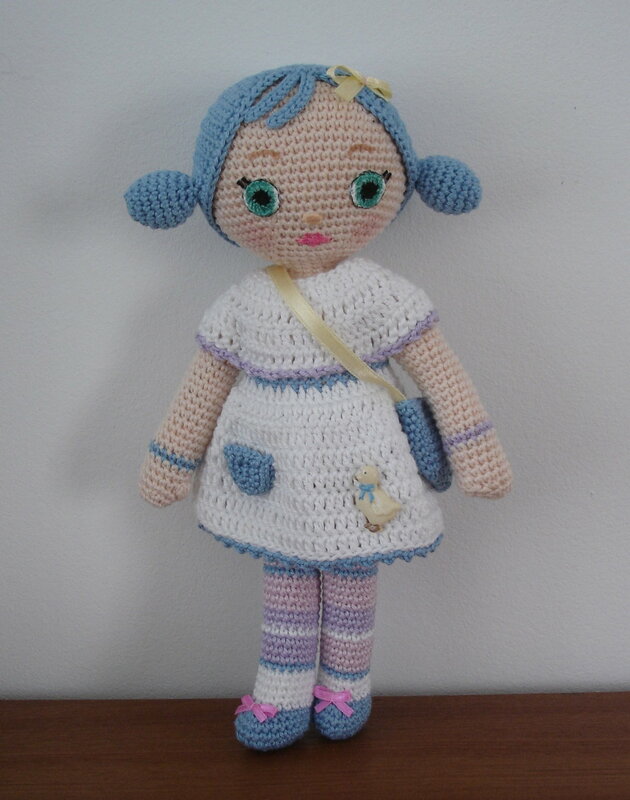 FIrst doll I started to crochet in thread which I ran off. As I was familiar with the pattern when doing this, second doll was easier for me to improvise here and there. Thought she has got the hair, brain would not be seen anyways, so left it out. Another change did with feet, but only when it comes to round with BLO. Instead of them I used Bpsc (back post single crochet) what gave shoes (I decided to do instead of bare feet) more stability. Open wound, as you can see, added only on knee area. The blood and scratches on the arm and face I painted with red markers. Aha! What I tried on this doll was eyelashes made from textile. All of you that like making dolls, textile eyelashes are “must do”. One of these days will try to show you how it is done. This was my first try to make textile eyelashes so they didn’t end exactly how I wanted, but now I know more and will share it with you. Conclusion: the pattern was easy to follow. With photos Jennifer provided even the novice in making dolls will find it easy to understand and finish this doll from head to toe, including all the details. What I was impressed was the brain pattern Jennifer created. There is little bit work with it as you have to increase and increase, and increase some more, but once finished, you end up holding little brain in your hand that looks so realistic. Pattern is great and I recommend everyone to try it. If not now, save it for Halloween as these zombies make nice addition. They are soft and tender dolls that are really nice to hold. And are pretty big ones as well. My doll didn’t end as big as Jennifer’s (26 cm ⁄10.24 inches tall), but still ended up soft and makes great addition to collection. Once again thank you Jennifer for creating this great pattern. This week we have got new treat for all doll lovers. Girls will love this one. 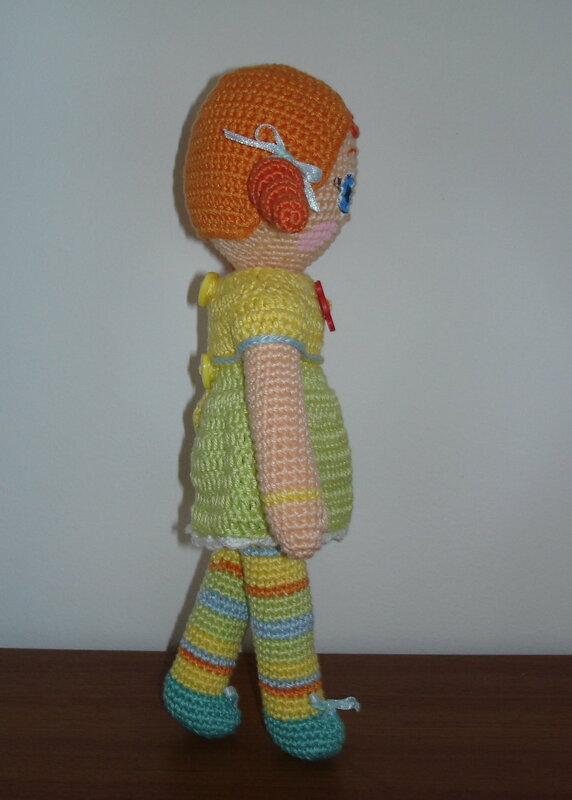 Moms and grandmothers as well as it is easy and fast project to do and doll is not a small one and has no tiny pieces to sew or work with. I find it real treat for big and small ones and all thanks to Kathy from Facebook group who asked for the pattern to be created for her granddaughter. Here are two of my Mooshka dolls I made while working on the pattern. 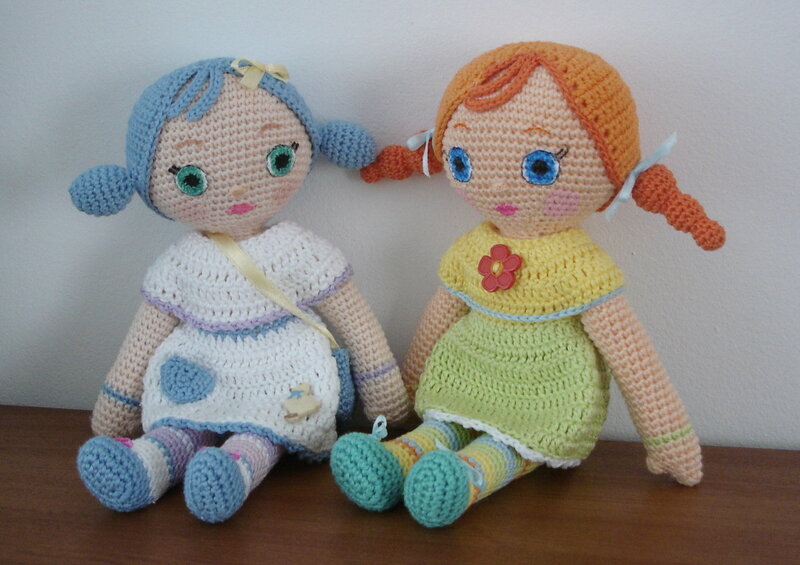 Will not talk to much but will leave you with the pattern and few more photos of dolls. For any questions you might need while working on this little cute one, please feel free to contact me and ask. To give you better presentation on how doll looks like when done, tried to make photos from side and back view as well. 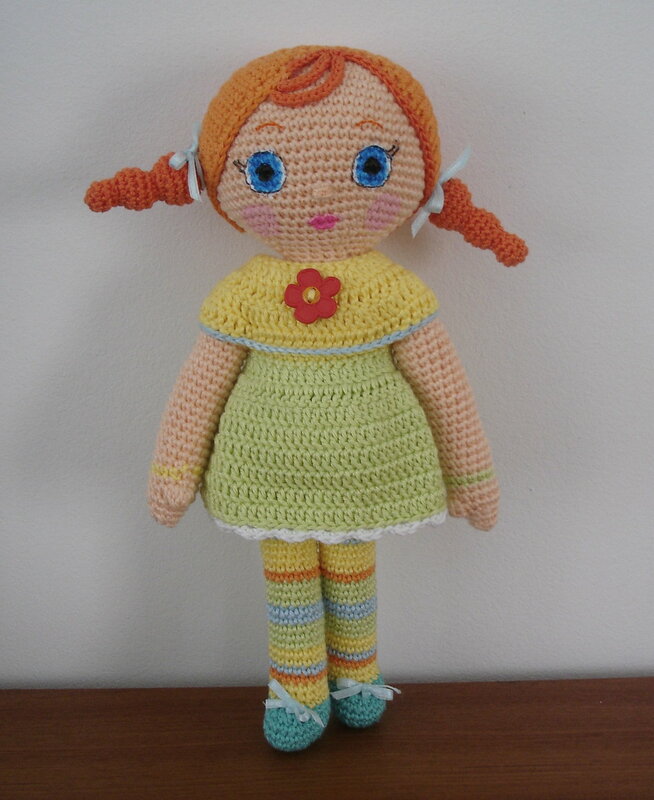 It is flat doll, very much looking alike a rag doll. As you can see eyes on this doll above is painted. She is second one I made. 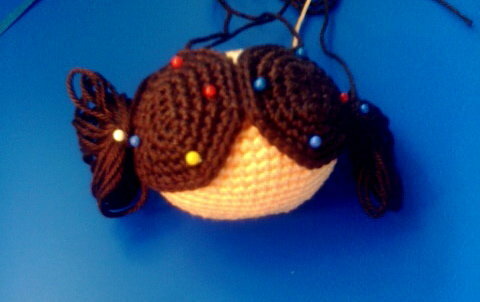 First one I have made with crocheted eyes. I have written you down how to make crocheted eyes as well. Also tried to give you as many details as possible on how to make eyes and what size to use when painting them, making them in felt or using safety ones. Mooshka dolls can be made in any yarn of your choice with matching hook to go with it. Finished doll size when worked with DK (medium weight yarn) with 2,5 mm hook (as dolls you can see on the photo) are 26cm tall (10.24 in). 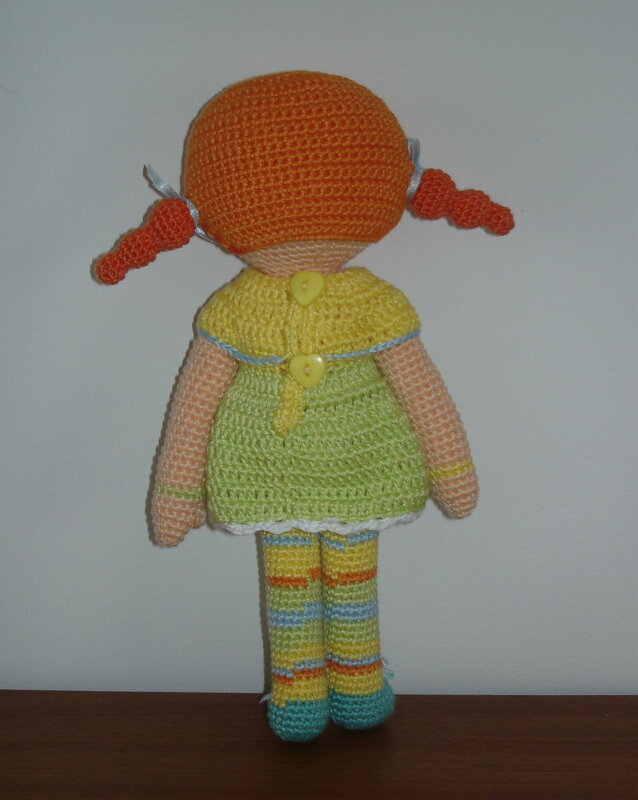 The rest of the doll (legs and dress) can be made with leftover yarns to make Mooshka as colorful as possible. Ribbons, buttons, beads….anything you can imagine or like to decorate Mooshka’s dress, head, shoes. Emboidery thread to crochet the eyes or textile paint if you would rather paint them. If you prefer safety eyes, find one that will fit the size 5×5 stitches of your gauge (what will depend of yarn and hook you will use. Make small piece 10 sts x10 rows and find the adequate eyes based on that. Important is that eyes do not exceed 5×5 stitches). Embroidery thread or pain for eye brows, lips. I didn’t write it in the pattern but head is done in finishing rounds. Start each round with ch1, and finish it with slip stitch. Tie off and sew the last row closing it nicely. Hide the thread inside arm area. Note! When reaching R22 of this, second arm making. Pay attention to where the cluster stitch will be. It should face the inner arm side. I didn’t have problems with any of the arms and this finger making, as I started to create arm under arm area. This way, to make thumb was on both hands first stitches to start with on R22. Even though there are 30 sts left for the body to continue with, we will stitch corner stitches as well (to close the gaps under arms) and make 34 sts round. Start body making the first stitch under arm stitch (this you will achieve by stitching front and back corners stitches first. Saying this, as it will make the body look nicer, when we start decreasing and increasing two stitches on each side to shape the doll’s body. Stuff the body nice and firm. We will add more and finish stuffing before closing last round. Tie off leaving long end for sewing the body and legs. First we will sew the body. Using embroidery needle, sew the last round with whip stitch using just front loops to (this will close the round nice and give it even closure). Before sewing it completely, add more stuffing if needed. Flatten the leg opening on the top making sure when flattened fingers and heal are pointing right directions and leg is not flattened sideways. Sc8 stitches stitching through both sides of the top leg piece, closing the leg this way and making it ready to be attached to the body. 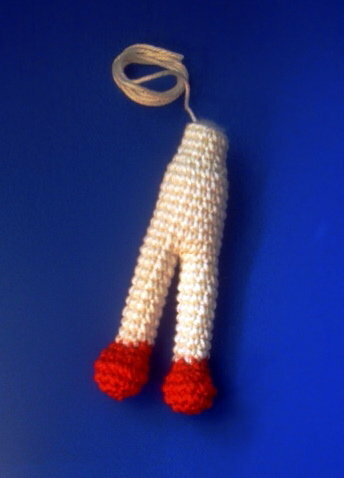 Tie off leaving long end for hiding it in the leg or doll’s body later. sc1 in magic ring. Ch11, slip stitch 10 to chain just made, sc1 in magic ring again, ch11, sl st 10 to chain just made, continue with sc on the other side of the hair, sl st last, tie off and leave long end for sewing the hair to the head later. Pony tails can be made many ways. We can add tassels on sides, crochet buns…you can place them on sides or upper on the head. Tie off leaving long end for sewing the bun to the hair later. Mooshka in white dress has crocheted eyes. I made those with embroidery thread and 1,25 mm hook. You have to keep in mind that I also worked with medium weight yarn and 2,5 hook. If you have worked with heavier yarn and bigger hook, you might end up experimenting with the right eye size and what thread to use to make them. To make eyes looking as similar as to Mooshka, they should not exceed the size of 5×5 stitches (on the head). Don’t feel discouraged, but give it a try with different threads or yarns to reach the right size to make eyes. If this you will find to complicated you can always make eyes with felt pieces or paint them what will make them as beautiful and easier to do. Add white to sides of each eye through over 4 stitches making slip stitch, 2sc and ending with sl st. (finish off nice and hide ends on the back side of the eye. For the eye lashes I uses starting and ending thread from making the pupil. Instead of hiding them I placed them on side, fixing them to stay with tiny bit of glue before sewing them on the head. For sewing the eyes I used so called invisible thread. Place the eyes between rounds 15 and 19 leaving 8 stitches between them. Once you sew them or glue them on the head take finest black marker you can find and color the back loops of the outer eye circle. This way you will round the eyes and make them doll looking. You can embroider the black circle around eyes, but use fine black thread to do it. You can embroider or paint the eyelashes and lips. Embroider the nose in the middle of eye area, one round lower (that would be in between rounds 19 and 20). Use two horizontal stitches for embroidering the nose. Place the lips two rounds below the nose. Eyebrows somewhere on the third round upper from the eyes. Use little blush to dolls cheeks (or if you are painting the details, use pink paint for the cheeks as well). And that it is! Your Moosha is done! Hope you enjoyed making your Mooshka. Looking forward to hear from you and see your Mooshka dolls! 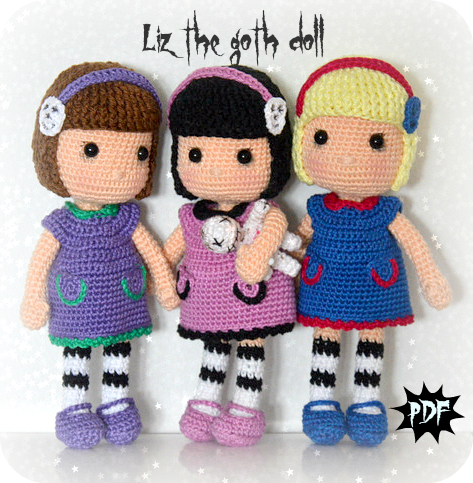 These three dolls were one of my first attempts when started crocheting dolls. Experimented a lot with different head shapes, hair styles. BB dolls came out of these little ones. 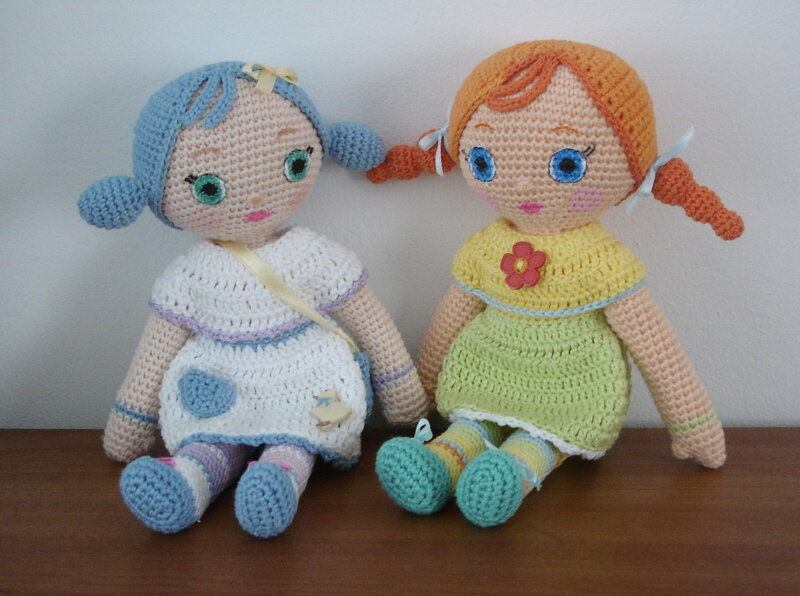 Have ben asked recently more than just few times for the pattern on how to make these dolls. Instead of writing separate mails and sending them, decided to share the pattern for all and make it available as all of my patterns so far. This one is really easy and fast to do. For those that have tried making BB dolls will see that only the shape of the head and hair is different. Suggest you work with fine cotton yarns (DK to be the maximum weight to use), together with 2-2,5 mm hook (depending what yarn you will work with). 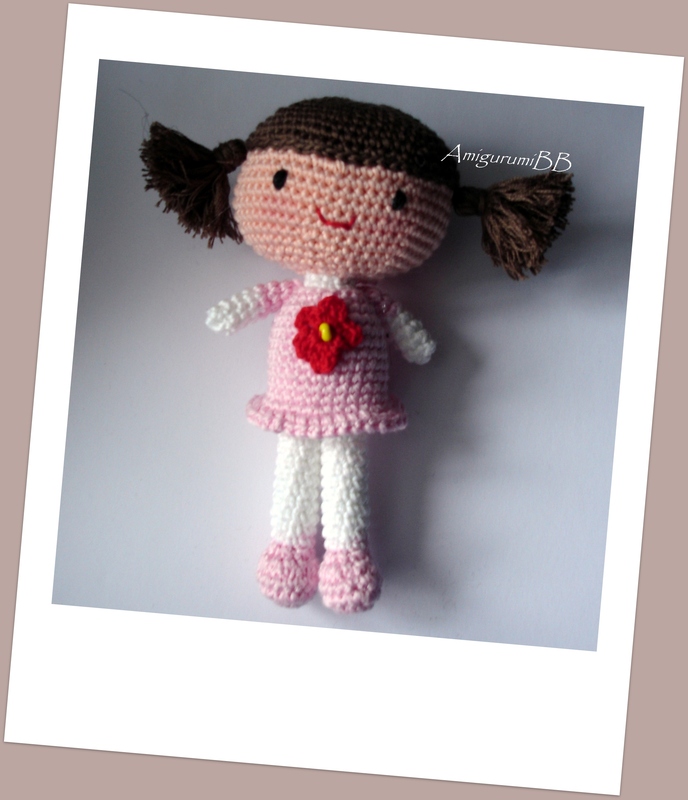 Dolls are small, only 5 inches (12 cm) tall, and were created as pocket or girl back pack/bag dolls. Ones girls can carry all around. I don’t have all the photos made to show you all of dolls I have made in such way, but they turn out when crazy colors are used for hair; like green, pink, purple. It gives them this bright and cheerful appearance that girls like very much. Let us start with the pattern (so you can get started making them )! start stuffing the head at this point. In the photos below, I made sample of two same size hair pieces, placing them evenly on each side of the head. You can play and make them differently. You can make one bigger, the second one smaller making hair look as combed on side. You can make one big one on top of the head with pony tails on each side or just one on top of it. It is really up to your wishes, likes and desires. Here is just a sample on how it goes for you to understand on how to play later. Hair is done out of two “discs” and two tessels. Tie off leaving long end for sewing the hair piece on the head later. Proceed shown on the photos. 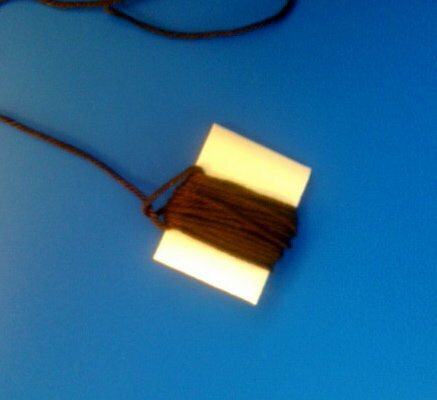 I used an old embroidery thread cardboard, that was about 3 cm wide (1,3 inches) to make a tassels. 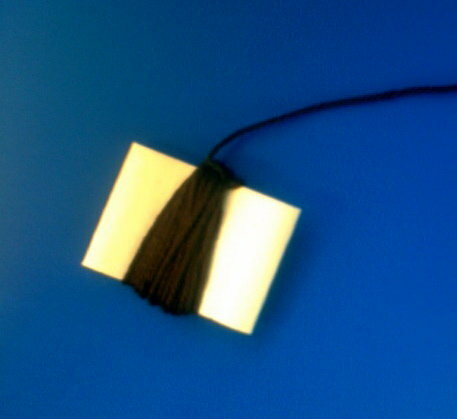 So before everything cut a piece of cardboard of desired length to use to make tassel. 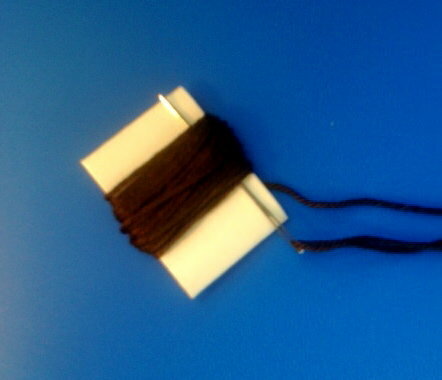 Once you prepare the cardboard or anything you can wrap your yarn over, wrap the yarn over the “tassel maker” 30 times (less or more… depends on how thin or thick your yarn is or how you want your tassel to look). I wrapped 30 times. Cut the yarn leaving long end and thread the needle (as seen in photo above). Now what you have to do is push the needle through the middle of wrapped yarn (close to cardboard you go). Once gone through, make a knot you will tighten when pulling the yarn. Now take the tassel of the cardboard and make few more knots like this, pushing through the middle of the tassel, making knot and pulling. Once done, you will see your tassel becoming firm at the end where you have sewed. Now try to push the needle through the yarn on top of the tassel (one you sewed while making knots). make three-four knots on top of it. 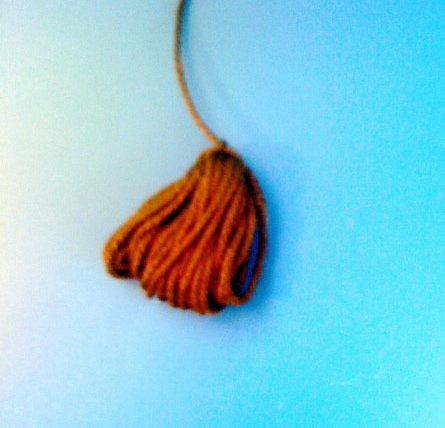 Your tassel is finished and ready to be sewed on head now. If you will find it difficult to follow (because I am very bad describing and specially bad taking photos) please try to google on how to make tassel in order to find instructions for your better understanding. Once done with all four pieces, pin them all on the head the way you like and sew all around. In order to make one big piece of “disc” on top of the head, start making the disc as described in above pattern but increase evenly every round by 6,until you make 54 stitches total count. You can add two more rows 54 to finish the piece and make it fit nicely the head. For one bigger one smaller; start as described in the pattern above, bigger disc make with last round stitch count 48, and the smaller counting 24 or 30 stitches. Make legs first, then join them together and continue making body. Tie off; stuff the leg. At this point stuff the leg and bring both legs together. Fingers/heals pointing same directions. R16 Stitch all around making 18 stitches around. Put the dress over the body and sew head-body parts together. Add some stuffing between head, body so the head doesn’t flop around. Sew on the arms. When done with body, you can start sewing the hair pieces together. Place and pin discs on top of the head. Sew them nicely all around. Place and pin tassels the way you want them to be and sew them nicely. Embroider the eyes or if you are using safety ones place them in between rows 9-10 (embroider over round 10). Embroider mouth right below round 12. Your new doll is done! Quick and easy, isn’t it!? 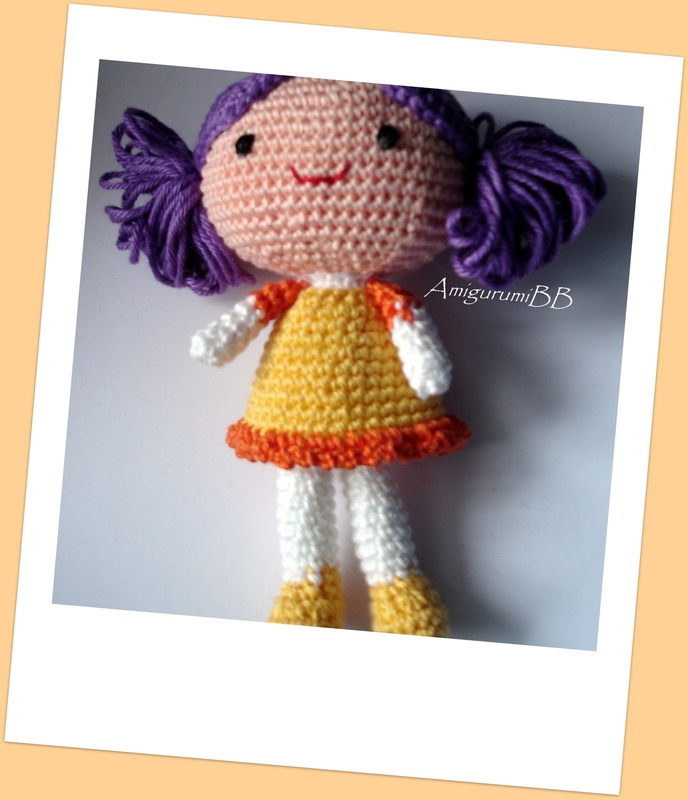 I hope you will enjoy making her and your daughters and granddaughters will love playing with her.